Marzia Colonna returns to Sladers Yard in a very special exhibition with her daughter the ceramic sculptor Fiamma Colonna Montagu in the ground floor gallery as part of the exhibition night and light and the half light. Marzia’s work is available to view online further down this page. Please call the gallery on 01308 459511 or email gallery@sladersyard.co.uk to enquire. Marzia Colonna has lived and worked in West Dorset for thirty years. She draws inspiration for her collages from the flowers from her garden, the interior of her studio and most of all her surroundings in the coastal landscape here and in her native Italy. Her sculpture evokes human situations and emotions. In this exhibition Marzia is showing her collages with sculpture by her daughter Fiamma Colonna Montagu. 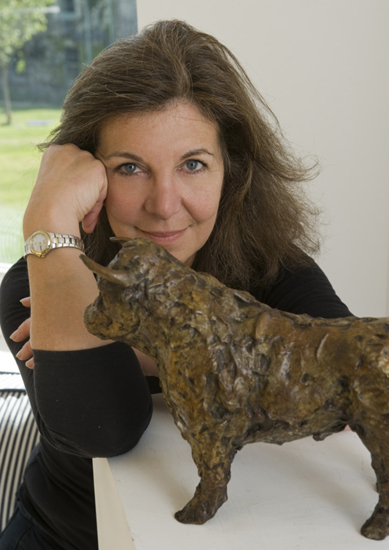 A selection of Marzia’s bronze sculptures can be seen further down this page. Viewings can be arranged by appointment. Marzia Colonna’s great talent is to take us directly into her subject matter. Whether she is working in collage or in sculpture, she is able to provoke a response. We feel the physical sensations of being in that place or situation. ‘I try to become a part of my subjects, animate and inanimate, and get to the essence of what they are,’ she says. Marzia Colonna’s sculptures have been commissioned for public spaces including ‘St Aldhelm’ in Sherborne Abbey, ‘The Mermaid’ at the National Sailing Club, Portland, the ‘Christ’ in Salisbury Cathedral and the ‘Kite Flyer’ in Winchester. Collected widely in the UK and abroad, Colonna’s unique voice speaks to us through her sculpture and her collages. Described by Adrian Hamilton (The Independent) as ‘some of her most exciting and pleasurable works,’ the collages she creates draw us in, inviting us to feel what moves her, whether in a landscape or an interior, we become part of a moment in time. Her disciplined approach to collage underpins the work with a strong abstract quality of mark and pattern. Her collages are made entirely from paper painted beforehand. “When I work with collage I feel I am sculpting with paper and painting at the same time. After looking for a long time at my subject matter. It is fast and furious work; holding on to and trying to replicate the memory of the landscape that I have experienced, not just visually in its form and colour, but also in the impact created in my mind by the wind, sun, rain, smells and sounds”. Marzia Colonna was born in Pisa in 1951. She entered art school aged 12 and continued to study at the Academia di Belle Arti in Florence. In 1970 she moved with her husband Robert Montagu to England. Her first solo exhibition in London was in 1979. Since then she has exhibited regularly. Her work is in many collections in Europe, the United States and Australasia. Since 1985 she has lived and worked in West Dorset. A major sculpture was purchased in 2001 by the Jerwood foundation and in 2002 by Newby Hall sculpture collection. Marzia Colonna’s new collages can be viewed below. Please call 01308 459511, email gallery@sladersyard.co.uk or respond to this page if you would like to enquire or buy any of these works. Click on an image to find details and prices. Giclée prints of the following five of Marzia’s collages are available now. They are beautifully scanned, signed, numbered and printed in small editions. In 2015 Marzia Colonna filled the gallery with her second solo show of collages and sculpture. The exhibition focused on her Lovers series. We are happy to arrange viewings of Marzia’s sculpture if you are interested in owning one.